Heard Right and Upteka join forces to bring you 'Mornik / Glimmer', a fantastic new EP from two of Belarus' brightest producers. Heard Right is back on Colorize after a fantastic debut label release in 'Don't Know / Episode' which was supported by the likes of Cosmic Gate and Jaytech. He is now joined by fellow countryman Upteka and they combine to bring you some exquisite Progressive House. Opening track 'Mornik' is resplendent with an airy flute lead and lush vocal pads while 'Glimmer' is more gritty with its prominent bass synth and imploring vocalisations. The two tracks fit together perfectly and form a cohesive House project perfectly suited for early hours in a club setting. 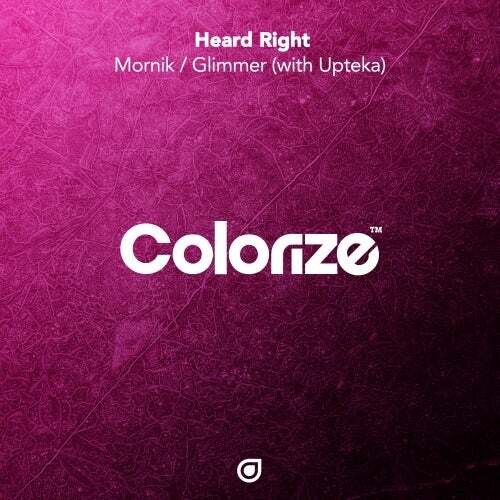 A Belarusian delight to the senses, Heard Right and Upteka's effortless collaboration EP 'Mornik / Glimmer' is out now on Colorize.